Right after sending our angry letter to ToastBox (I don’t think I would want mention why just because the general manager was nice to us and they have already made solutions to their egg mishap), they have decided to give us a P1000 gift certificate and give us our money back! We decide to use it a few weeks after the incident and went to a different branch of course. I ordered the “Nasi Lemak” and Barley Drink. 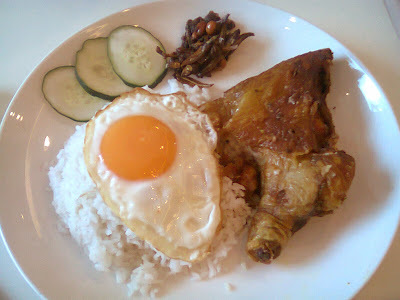 Nasi Lemak dish includes a rice soaked in coconut cream right before steaming, a side of Dilis mixed with roasted peanuts and a slightly spicy sauce, a sunny side up egg, slices of cucumber, and accompanied with a tasty fried chicken seasoned with a bit of turmeric if I’m not mistaken. Two thumbs up!